Can a marriage survive after a husband considers murdering his wife? The emotional logic of whether a marriage could survive a husband’s murderous intent—after he’s been seduced by a big-city girl, before the seductions of the big city itself—is secondary to this movie’s glistening vision, which never stops flowing or transforming. No American movie until this time had made so persuasive or ecstatic a case for the dream language of cinema, Sunrise’s urban civilization a fantasia with hair salons that look like palaces and carnivals that put to shame a Vegas casino. 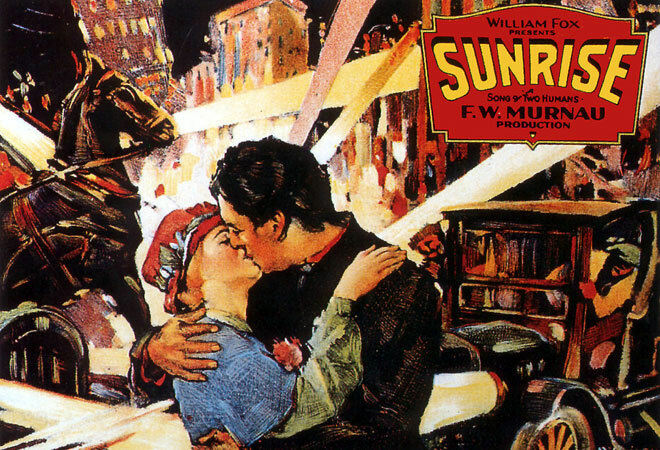 With the advent of the sound era only months away, Sunrise—along with Dreyer’s The Passion of Joan of Arc (Essential Movie Library #3)—represented the silent era’s pinnacle of what film could be. German ex-pat director F. W. Murnau, who made his mark with the first classic vampire picture, Nosferatu, was given nearly unprecedented freedom, and when Sunrise was a box office flop he never got it again. Hollywood still took note in all the best and worst ways having to do with potential and pretension—giving this the best “artistic production” Oscar as opposed to the best picture award that went to the blockbuster Wings, the first and last time such a distinction was made—as did filmmakers from Orson Welles to Vincente Minnelli to Federico Fellini to Baz Luhrmann.